For Day 5, the last day of the Artist Challenge, I have chosen two paintings that are a bit different from venues I gravitate to. 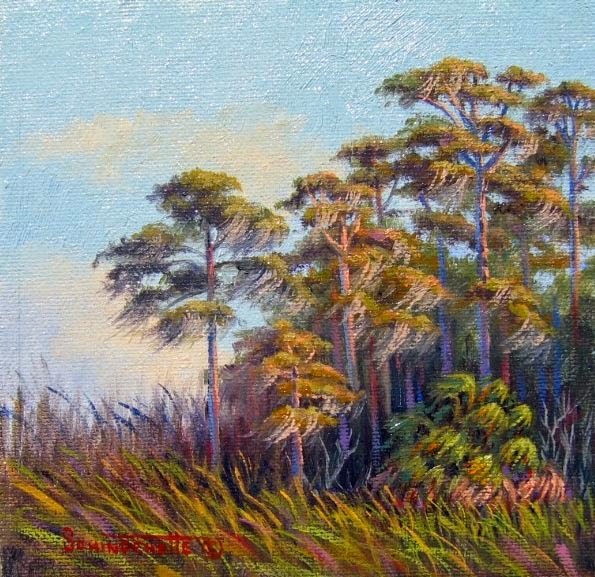 "Grey Day" was painted during a plein air event in Evinston, FL. a few years ago. Wild flowers were in bloom and the day was dark and overcast. I had just finished painting the Wood and Swink Post Office when this scene caught my eye. 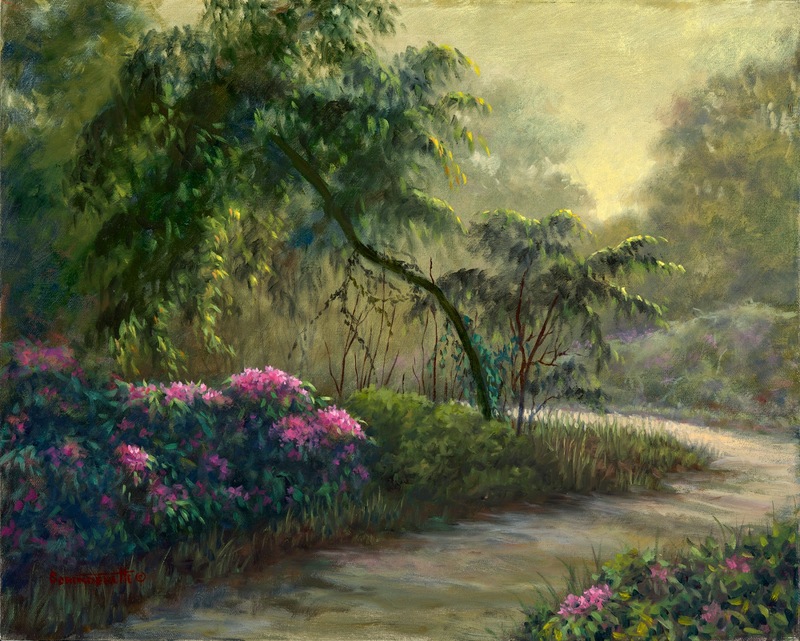 "Golden Pathway", the second painting is a studio work inspired by photos from a trip. The light that day was spectacular. The sun shown through a veil of mist making everything take on a golden hue. 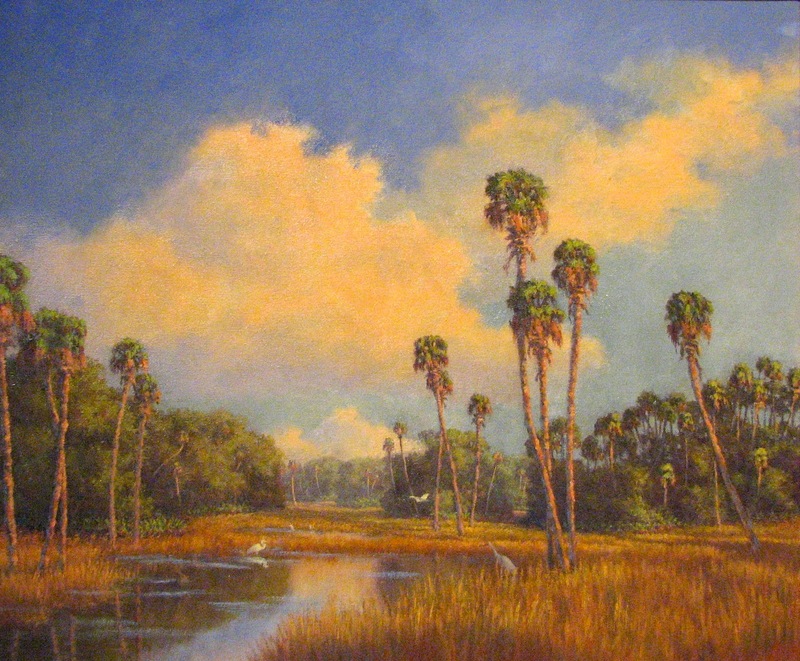 This was a gorgeous day, late in the afternoon when the sun casts a warm glow causing the clouds to brighten and the tall grasses to turn brilliant oranges, golden yellows and warm reds. and Elizabeth Ferber. All are very talented artists and friends. I know you will enjoy seeing their work. Day 4 of the Artist Challenge brings more memories. 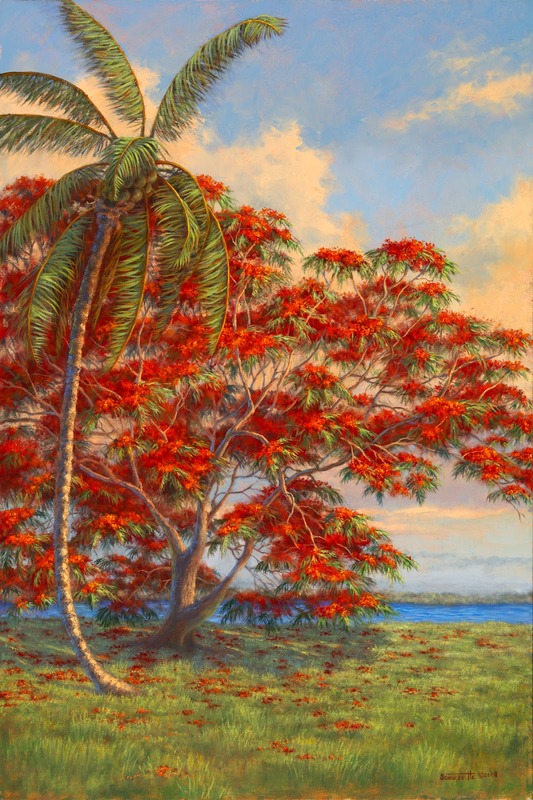 This painting of a Royal Poinciana Tree and Coconut Palm was inspired by many painting trips to the Ft. Pierce Inlet. 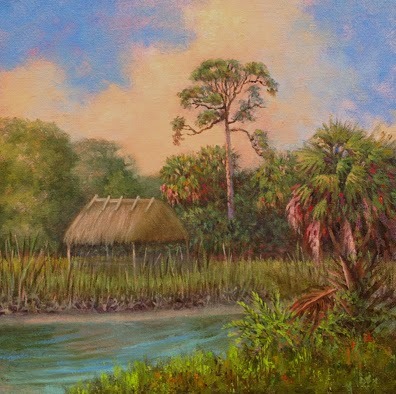 It is in the private collection Ft. Pierce natives who live on the Indian River Lagoon. 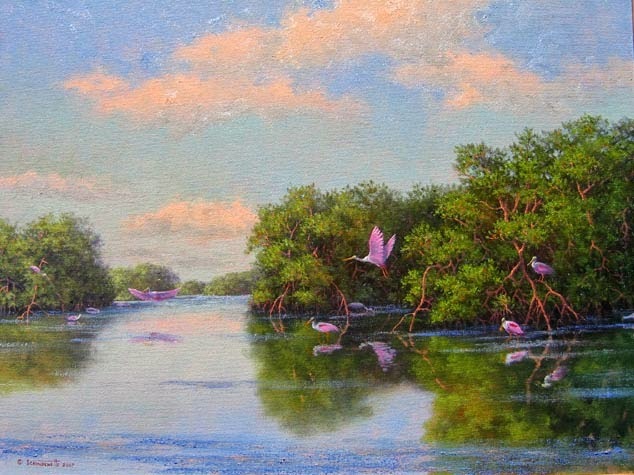 The Lagoon also inspired the Roseate Spoonbill painting. Kayaking on the Lagoon reveals many hidden treasures. 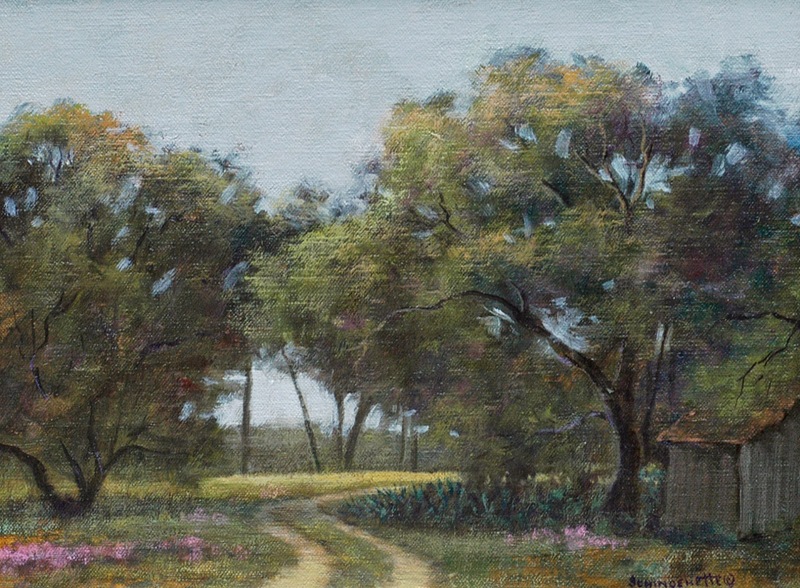 And, of course, another painting from Bud Adams Cattle Ranch. enjoy painting the interior. 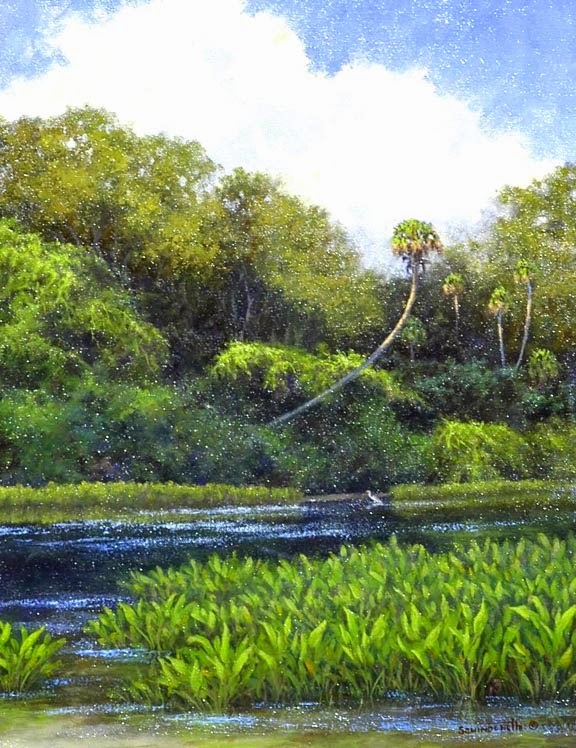 The hammocks, pine forests, rivers of grass and natural springs and river hold more of a mystery for me as a painter than sandy beaches and coconut palms. Don't get me wrong, I also like to paint swaying palms and crashing waves, just not as often. 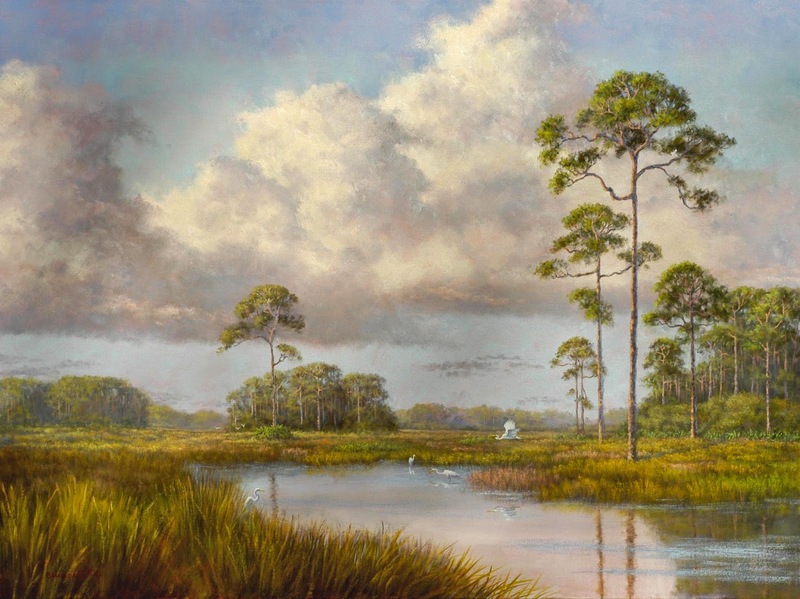 Day Two of the Artist Challenge brings back more memories of plein air painting in the 90's on the Bud Adams sprawling cattle ranch in St. Lucie County. Bud kept his property as close to "natural" as possible, instructing his cowboys to eliminate any plants not native to Florida. No hunting was allowed on the property so wildlife was abundant. 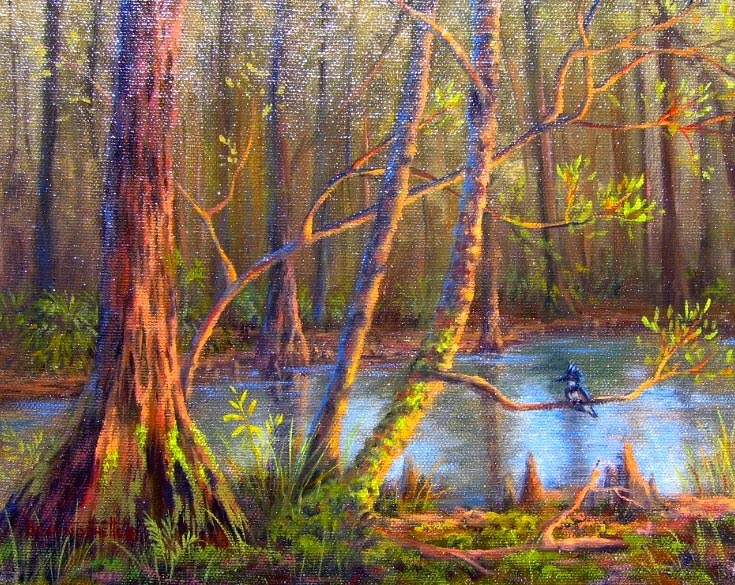 White tailed deer, flocks of wild turkeys, egrets, herons, ibis, alligators, etc. could be seen on every trip onto the ranch. These are three paintings from those "good ole days". 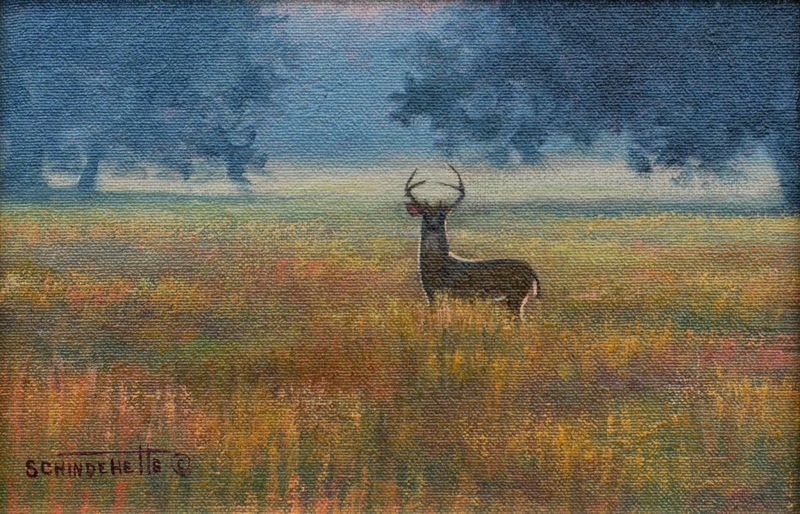 If you enjoy seeing original art of all types now is the time to be on Face Book. A challenge is circulating throughout the arts community with individual artists challenging artists of their choice to post 3 of their works each day for 5 days, then that artists challenges other artists to do the same. What makes this so exciting for everyone is that all on Face Book get to see and enjoy art that they otherwise may not have had the opportunity to see. New artists may be discovered by collectors and friendships forged. My friend and artists Susan Koon has honored me with this challenge. This is day one and these are my three paintings.